More than two decades after his death, Jim Henson remains a pop-culture figure so singular and fascinating that his life commands upwards of 600 pages of biography. When it comes to illuminating that mystique, Brian Jay Jones’ Jim Henson: The Biography is never more telling than in passages describing the tensions the Muppet man could cause with the simple flick of his attention. His magnetism was so strong that the act of prioritizing one project over another caused jealousies to ripple across the transatlantic arms of The Jim Henson Company (then known as Henson Associates). If he spent too much time in England working on The Muppet Show, The Dark Crystal, or Labyrinth, anxiety seized the Henson staff in New York. But if he lavished too much praise and attention on the people working in his New York workshop and business offices, it raised the hackles of the employees in the London Creature Shop—that “creature” distinction being a great source of consternation to the New York contingent, who were perceived as only building Muppets. As Jones tells it, working for Henson could be a constant struggle for the praise, approval, and, in a way, love of the man who made it all possible. A variation of that tension bubbles underneath the surface of The Christmas Toy, the fifth of six (or sixth of seven, if one counts Fraggle Rock’s third-season premiere, “The Bells Of Fraggle Rock”) Christmas specials produced by Henson during his lifetime. 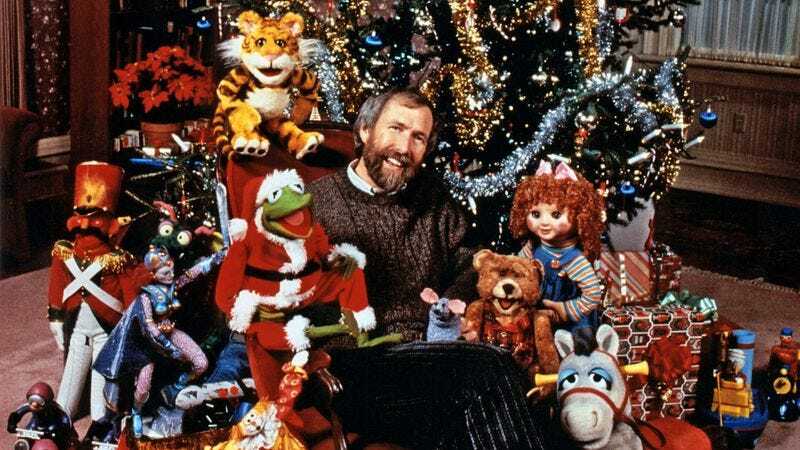 Henson’s congenial chaos always played well between commercials for the season’s hot toys and green-and-white M&Ms: Before there was a Muppet Show, even, there was The Great Santa Claus Switch. But The Christmas Toy is different from Emmet Otter’s Jug-Band Christmas or Muppet Family Christmas or Christmas Eve On Sesame Street. There’s a distressed edge to the special, and life-or-death stakes that go beyond winning a talent show or getting Miss Piggy to Ma Bear’s farmhouse. The Christmas Toy is downright dark in spots, which is perhaps attributable to the sense that, like the special’s school-aged protagonists, Henson’s toys had come to life while his back was turned. The Christmas Toy is a proto-Toy Story whose characters bear a tactile look that Pixar’s playthings have only acquired in the past few years. Though there’s an ensemble cast lending the show the proper amount of Henson disorder, the script by Fraggle Rock scribe and Labyrinth co-writer Laura Phillips largely concerns Rugby Tiger, star of the playroom. Muppet performer Dave Goelz imbues Rugby with a spectacular sense of swagger, retaining his cool when the announcement that it’s Christmas Eve throws his cohorts into a panic. As he hazily recalls, he’s in no danger of being replaced by some flashy new trinket, because Christmas is his day. Last year, on his first and only Christmas, Rugby was the main attraction, the favored gift young Jamie said she would love forever and ever. In hopes of repeating the greatest day of his life, Rugby makes the trek down the hallway to take his rightful place below the Christmas tree, a journey fraught with danger. As the characters helpfully explain in the special’s early scenes, to be caught “out of place” by Jamie or a member of her family is to suffer the toy equivalent of death: forever frozen, cursed to be the lifeless object their owners assume they are. That threat distinguishes The Christmas Toy from the other Henson Christmas specials. Sure, Doc has to save Miss Piggy from freezing to death in Muppet Family Christmas, but even that show’s menacing blizzard pales in comparison to the sight of Ditz the clown crumpling into a heap in The Christmas Toy’s horror-movie corridor. Nodding toward one of its primary inspirations, The Velveteen Rabbit, The Christmas Toy doesn’t euphemize the potential doom awaiting these characters. After Rugby’s latent compassion revives his “cat toy” buddy Mew, Mew describes the experience of being frozen in terms usually reserved for coma patients who turned away from big, bright lights. The danger helps give The Christmas Toy its identity, but it also makes the special feel slightly off. That could be because it’s the Henson Christmas celebration that involved the least hands-on participation from the man himself. Phillips handled the script, fellow Fraggle Rock regular Eric Till directed, and Henson’s only contributions to the main action come courtesy of a squawky jack-in-the-box. (He also recorded bookending segments—scrubbed following Disney’s purchase of the Muppet Show characters—as Kermit The Frog, serving the emcee role he’d held for one-off Muppet projects since the unsold 1962 pilot The Tales Of The Tinkerdee.) It was a matter of timing as much as anything else: The Christmas Toy was produced at the end of 1986, a year that saw the premiere of (and disappointing reception to) Labyrinth, as well as the development of two ambitious TV works, The Tale Of The Bunny Picnic and The Storyteller. The only acknowledgement of The Christmas Toy in the pages of Karen Falk’s Imagination Illustrated: The Jim Henson Journal is an approximation of its shooting date; within Jones’ biography, it’s swallowed up by Labyrinth’s hectic promotional schedule and the campaign to sell The Storyteller to NBC. Within that timeframe is another important date: In May of 1986, Fraggle Rock closed up shop. Because the show’s development and production coincided with its creator’s busiest filmmaking period, Henson had been a fleeting presence in its life, performing only supporting roles and handing the operational reins of the program to head writer Jerry Juhl and producers Diana Birkenfield and Larry Mirkin. Though Fraggle Rock would air new episodes on HBO through 1987, The Christmas Toy served as something of a reunion for its various Fraggles, Doozers, and Gorgs, bringing together a chunk of that show’s cast—Dave Goelz, Richard Hunt, Kathryn Mullen, Jerry Nelson, and Steve Whitmire—along with Birkenfield, Phillips, and Till. In portraying a secret, magical world overlooked by humans, The Christmas Toy is perfectly in line with the spirit of Fraggle Rock. But it goes deeper than that: The Christmas Toy is ultimately a story of tolerance and acceptance, the sort of “world saving” content Fraggle Rock specialized in for 96 episodes. The special’s emotional turning point involves Rugby recognizing how much the now-frozen Mew meant to him—even for a cat toy. (The great irony being that Rugby, for all intents and purposes, is a cat.) Life in the playroom involves constantly welcoming and adjusting to new presences, be they Rugby (last Christmas), Apple the baby doll (the Christmas before that), or Meteora, the Buzz Lightyear-like figure who threatens to topple Rugby from his place of favor. The flipside of that is the sense of belonging shared by these characters, poignantly expressed in the stickiest of Jeff Moss’ original Christmas Toy melodies, “Together At Christmas.” The song secured a place in the Muppet canon a year later, providing the coda to Muppet Family Christmas’ all-cast sing-along. That cast, it bears noting, included Goelz, Mullen, Nelson, and Whitmire (along with Karen “Red Fraggle” Prell) reprising their Fraggle Rock roles. Many of those performers would be called back to the playroom in the early ’90s, picking their Christmas Toys back up for the short-lived spinoff The Secret Life Of Toys. Some aesthetic adjustments were made—the decidedly creepy Apple was replaced by Raisin, a ragdoll living comfortably outside the uncanny valley—and the tone was softened to make room for kid-friendly morality tales. The most noticeable difference, however, was unavoidable: The Secret Life Of Toys debuted three years after Henson’s death, part of a wave of posthumously realized concepts like Dinosaurs and Fox’s animated Dog City. It’s a bittersweet conclusion, appropriate for a special that ducks its darker nature to find its happily ever after: Rugby’s love brings Mew back from the brink, an act that spreads to the other frozen toys stacked in a corner of the playroom. However much The Secret Life Of Toys may have watered down The Christmas Toy, it nevertheless extended its most important theme: No one—no puppet builder feeling neglected by their boss, no teddy bear who’s been hugged to tatters—is truly forgotten as long as there are still people around who love them. It’s a fitting theme for the holiday season, a time to let the people you care about know you care, before it’s too late. In this life, no one can be resurrected with a tender melody and a heartfelt sentiment. But perennial favorites like The Christmas Toy perform a variation on that trick, allowing departed contributors like Henson, Nelson, Hunt, and Birkenfield to impact entire audiences born after their deaths. Most importantly, The Christmas Toy showed its many participants that they’d picked up a thing or two from the man whose name is above the title. It’s a departure from the holiday programming in which Henson was more directly involved, but it proves that people within the Jim Henson Company orbit could embody the warmth and humor of the man who drew them there in the first place. Unfortunately, they’d soon find themselves doing so on a permanent basis. But nearly 30 years after its debut, their efforts help The Christmas Toy retain its own sort of pull.